Last year I was honoured to be selected as an Artist-in-Residence by the Fredericton Arts Alliance, which hosts a group of local artists each summer in the historic Barracks District of downtown Fredericton. For the week-long residency, I was paired with visual artist Allison Green, who that week was painting on silk. The theme of the residency was “New Ground,” inspired by the arrival of thousands of Syrian refugees to the area in the previous months, and Allison and I thought and talked a lot about notions of place, home, and belonging as we worked and chatted with visitors to our little studio in the Barracks. 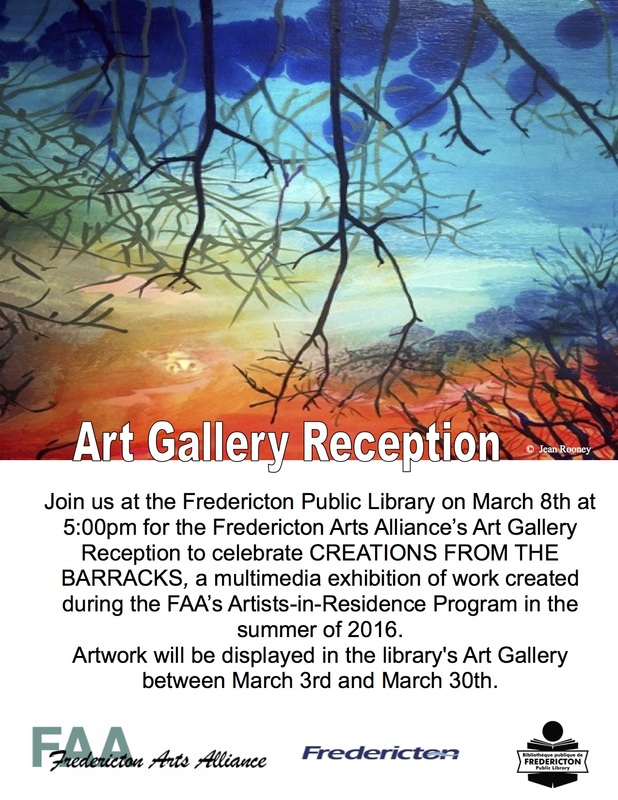 The work developed by us and the summer’s other Artists-in-Residence will be exhibited this spring at the Fredericton Public Library between March 3 and 30, with a special opening reception on Wednesday, March 8. I am contributing to the exhibit some new writing, including dialogue sketches and poems that grew out of the residency. I’m excited to be included in this exciting and diverse group of artists. Please come visit if you’re in the area.